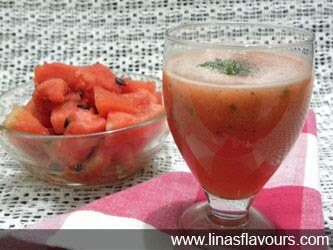 Take watermelon and pineapple pieces, add salt, black salt, pepper, mint leaves, sugar and blend it with a blender/food processor. Add ice-cubes, 2 glass of water and blend it again. You can change the measurement of black salt and pepper as per your taste. Garnish it with mint leaves and serve it chilled. You can also add finely chopped pineapple pieces.